Once on our way after leaving Peach Trees, our first task was to head into Kilcoy and find a tyre shop to repair the little hole that was left from us picking up a screw somewhere in our journey so far. 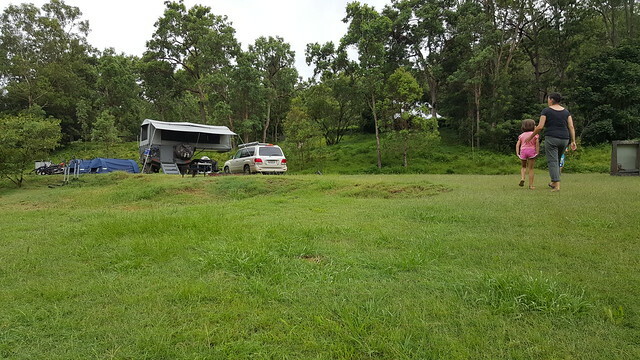 I kept a close eye on it on the way down the hill, and we were safely into Kilcoy, and after a short wait, had the tyre fixed and we were on our way. 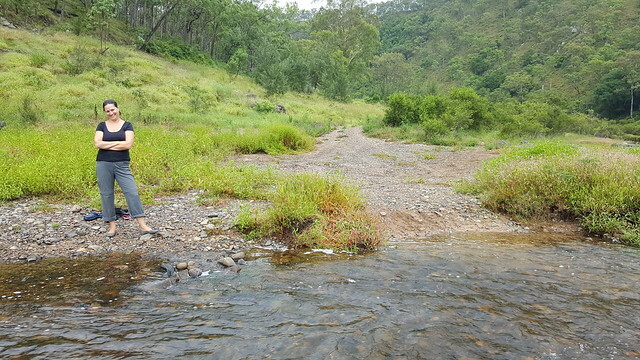 We grabbed some supplies and headed south on the western side of the Somerset Dam, and then the Wivenhoe Dam. 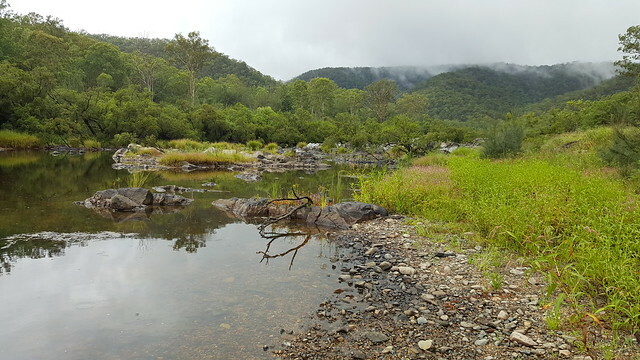 A fairly long day in the car later, and we arrived at the Clarence River Wilderness Lodge, not too far from Urbenville, back into NSW and the joy of daylight savings. 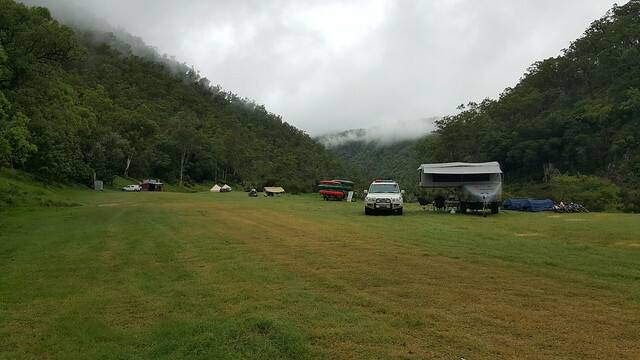 It was late in the day by the time we arrived, and we quickly set up camp in between some showers. We were excited to also see that there was another Ultimate camped not far from us. 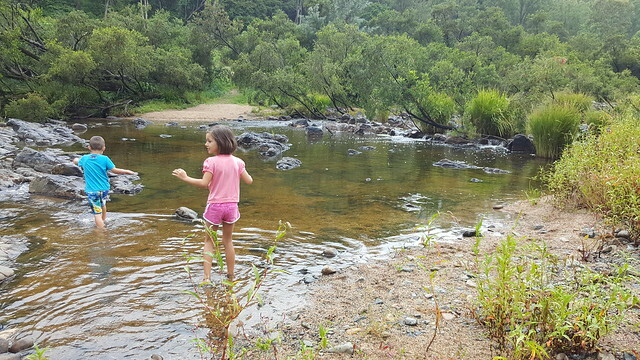 We were (surprisingly enough) right down in the valley, situated on the Clarence River, which was a beautiful spot – even with the constant showers that we would experience for the next couple of days. We did a couple of walks down to the river at different spots, and were amazed with some of the history of the place, particularly the height of some previous floods. Nice colours – no floods today! Naturally we had a couple of good chats with the Darrel and Monica, the owners of the other Ultimate, and compared differences between our trailers, and spent some time talking about all things Ultimate. We had considered 3 nights here, but decided again, to move on after only 2. The ease of setting and packing up has made it much easier to do these short stays. Somewhat surprisingly, we had a beautiful morning to pack up, after pretty much constant rain overnight. The climb out of the valley all on dirt roads was a low range effort, and a beautiful drive. We probably would have managed in high, but it was much easier for the car in low, and would mean that we wouldn’t find out that high wasn’t going to cut it, half way up a steep hill! We continued our journey south towards Tabulum, not really knowing where our next stop would be.